Penn’s Football team struck early and often in rolling past South Bend Clay, 58-6, on Friday, Sept. 29. Penn led 45-0 after one quarter and led 58-0 at halftime. Clay scored on the last play of the game. Hunter Whitlow got the Kingsmen rolling when he bolted for nine yards for a TD. Ryan Whiteman ran for the two-point PAT. Penn’s Wild Bunch defense struck for the next touchdown. Leegrand Alovili recovered a fumble in the end zone that was forced by James Morris. Brock Boynton hauled in a seven-yard TD strike from Ryan Lynch to push the Kingsmen lead to 22-0. 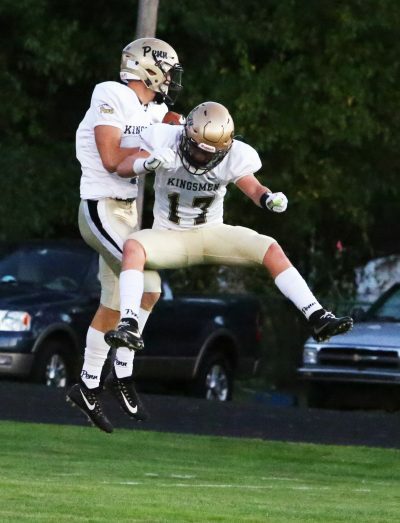 Lynch connected with Zach Usenick for a 39-yard TD pass as the Kingsmen lead grew to 29-0. Paul Moala broke loose for a 48-yard punt return touchdown. A safety by Rockne Hurley gave Penn a 38-0 lead. Brock Zolman’s electrifying 57-yard TD run finished off the Penn scoring assault in the first quarter and made the score 45-0. Jeremiah Gosztola scored a touchdown on a four-yard pass from Ron Powlus. Patrick Maclin raced 18 yards to finish the Kingsmen scoring.